Insurance is a risk protection coverage. And there are different insurance plans that young people must have before it’s too late. Here’s an insurance buyer’s guide for young people. Unlike wine, the older the better, insurance plans are best when bought at a younger age. Insurance is not something that you will read, talk or buy it every day, like watching a series on Netflix or Amazon. But surely, something to think about as dearly as you think of yourself and of your family. Especially, when it can cost you and your family more than you can ever imagine. Insurance, in a simple language, can be stated as a financial safety net against the loss that may cause a hole in your pocket. Not only that, without insurance, you may end up breaking up your life savings. No matter how healthy you think you are or even if you hit the gym every day and follow a diet, an unforeseen event such as suffering from a chronic disease, terminal life illness, or disability caused due to an accident or even death, may flip things upside down. It is a known fact now, irrespective of age, gender, and lifestyle, anyone can be a victim of such eventualities. And that’s where, insurance comes as a protective shield, offering a source of financial aid in the need of hour. Like a true friend. There are different types insurance. It is important to know the types of insurance, its purpose, and which one you should opt for. The interesting fact is that these days almost all types of insurance products are available online. Moreover, insurance products can be studied, analyzed, and can be purchased online. Compare various insurance products online and opt for the most suitable one. The quintessential question is, what type of insurance plan should I opt for, and when? To help you, here’s a simple guide. What Are the Different Types of Insurance that Young Professionals Should Know? Insurance is divided into two types: General and Life Insurance. General Insurance – It implies protection which does not include a human life of the insured. A General Insurance plan can be opted to get a cover, a protective shield for car, bike, health, travel, home, etc. The insurance company promises to pay the compensation for the loss occurred to the insured on the basis of indemnity, as a promise against the premium that the policyholder pays. Life Insurance – It covers the insured or his family against financial losses that may occur due to untimely death or permanent disability of the insured. Apart from covering the life assured, life insurance comes with different options. There are various life insurance products that come with an opportunity of investment and savings along with the life cover. Term Plan- A pure insurance product that covers the life assured against an untimely death. Unit linked insurance plan (ULIP)- Insurance + Investment opportunity. Endowment Plan - Insurance + Savings. Child’s Plan - Long term plan for child’s education or marriage. Money Back - Periodic returns with insurance cover. Types of Insurance Young Professionals Should Buy? Respect your pride. Cover your vehicle to legally drive and ride. If you own a car or a bike, or both – you need to have a vehicle insurance. A motor vehicle insurance provides a financial cover against any damage or loss incurred to you or your vehicle because of natural or man-made perils such as an earthquake, fire, explosion, accident, theft, etc. The government has mandated for every vehicle plying on the road to have a third party liability insurance under the Motor Vehicles Act,1988. However, to cover the own damage or repair cost incurred due to an accident is optional. But, who wishes to pay garage bills? Why not buy an insurance policy instead? 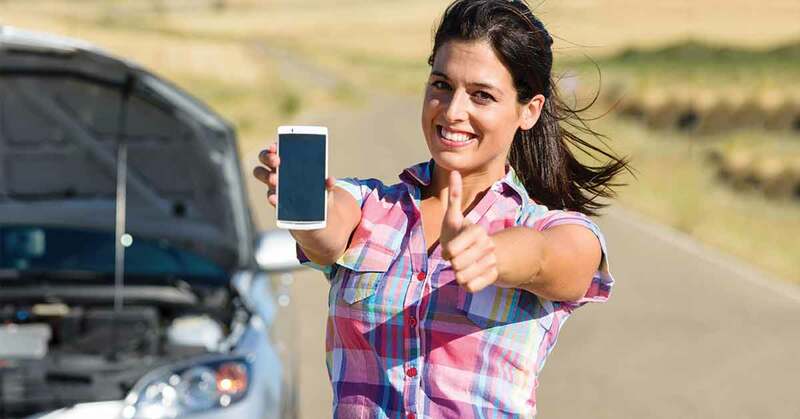 A comprehensive motor insurance plan helps in covering the repair bills at the time of claim. So, smart vehicle owners buy a comprehensive policy. Take Action: If you own a vehicle – Compare and Buy Motor Insurance. Health is Wealth. But, this statement is also equally true – You need wealth to recover from ill health and to maintain it. Don’t you find yourself in a messed-up situation, unable to do any work, or conduct a meeting, when you are down with cold and constant sneezing? God forbid, but…imagine your sorry plight, when you may suffer from dengue or malaria, or a heart ailment! Or for that matter, pollution - smog related ailments or car accidents, as you may have heard about the severity of such incidents in Delhi and Mumbai. Now, will you be secure with no financial support to cover the medical cost? The truth is, today’s hectic work life, and struggle to keep work-life balance has left no one safe anymore. Even youngsters are falling victims to diseases these days. No need to be afraid. Instead, stay covered. Because the rising medical inflation year by year can leave you in deep trouble. But there’s a way. Get a health insurance plan. A health insurance covers all the pre- and post- hospitalization, in-patient hospitalization expenses, etc. You can cover yourself and your family. A health insurance plan is not going to prevent you from getting hospitalized or provide protection from any kind of suffering. Rather, in case of medical emergencies, you will be financially supported and wouldn’t have to worry about arranging money for all the expenses. You will be saved from paying a hefty sum of money due to medical care that has become exorbitant. If unmarried, cover yourself and parents. If married, cover yourself, parents, spouse, and kids. Life insurance provides an opportunity to build corpus apart from providing life cover. These savings will help you in the long run and in the need of hour. A term insurance is a pure risk cover. Purely, a death benefit plan. In case of an unfortunate death of the life assured during the policy tenure, the life cover amount(sum assured) is paid to the nominee as mentioned in the term insurance policy. The sum assured received helps the family of the life assured to overcome financial crisis. Since a term plan is purely an insurance plan without any investment or savings component, the premiums are lower than any other life insurance products. You can get a high coverage at a very low premium. Youngsters must buy term plan at an early stage of their life, as soon as they start earning and are financially independent. With professional growth in career over the age, savings does increase. However, the premium increases too! Unlike wine, the older the better, term insurance plans are best when bought at young age. For instance, Raj with Rs.5 lakh as an annual income opts for a coverage of Rs. 1 crore. Condition: Raj is non-smoker and opts for a term till age as 65 years. Note: The premiums are indicative. The premium is much higher when you buy at the age of 35 years than thatif opted at the age of 25 years. Hence, it is advisable to buy a term plan and secure your family at an early age. If you are young, financially independent and wish to provide financial security to your family. If you have dependents-parents, spouse, etc. How to buy term insurance? Decide the coverage – sum assured. Compare term plans online – check inclusions and exclusions. Check Riders available – opt rider(s) if necessary. Personal Accident Insurance – The personal accident insurance provides compensation in case of accidental injury and permanent or temporary disability. And in case the life assured dies due to an accident, the nominee/beneficiary will receive a substantial lump sum amount as mentioned in the policy. However, along with a motor insurance plan, the policyholder is covered with a coverage of Rs.2 lakh in case of car insurance and Rs.1 lakh in case of two wheeler insurance. Moreover, when you buy a term plan, you can opt for an optional Accidental Total and Permanent Disability Rider. It widens the coverage and also helps the life assured in case of disability. Critical Illness plan – You can buy a critical illness as an optional rider with a term insurance plan or with a health insurance policy. Critical illness like cancer, tumors, coma, paralysis, kidney failure, heart attack, stroke of severity and other complex conditions are covered. The covered diseases varies from an insurer to insurer. In case the life assured is diagnosed with any of the listed disease in the policy document, the cover amount is paid as a compensation, which could be a life savior and helping hand in the medical financial crisis. As we all know, the cost of treatment for such disease is costlier than an average person can afford. 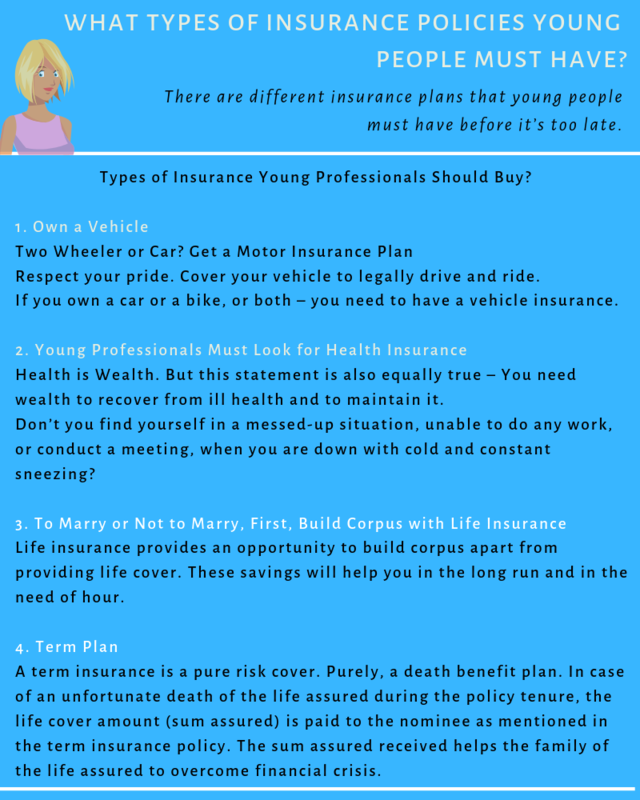 Here's a snippet of the various types of insurance policies young people must opt for. This simple guide will perhaps help you to get started with insurance after understanding its importance. You can call us and take help of our advisors or simply post your queries in the comments section, we’ll be more than happy to help you. Recommended Read: How can you save on your General Insurance Premium?